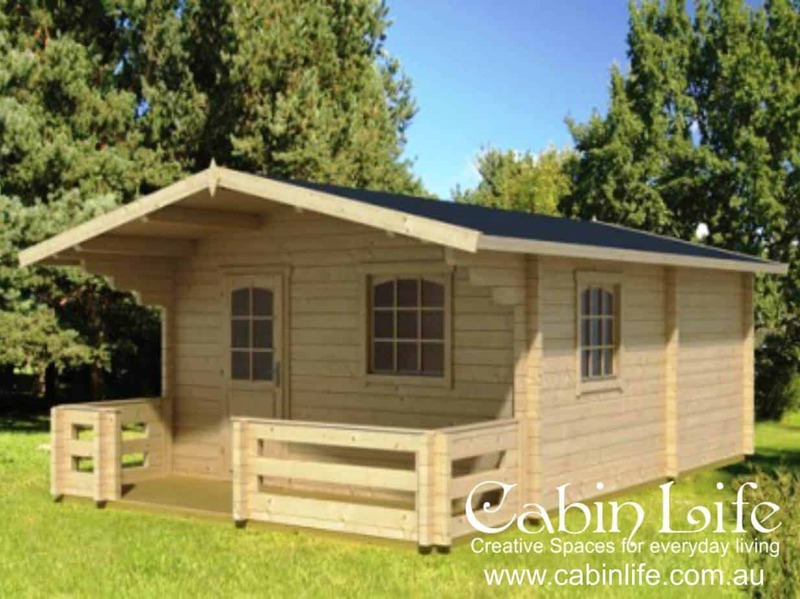 The “Brunswick” cabin kit is definitely our most popular larger designed cabin as it lends itself to a variety of uses. Some of our clients use this cabin kit as a home office with a toilet and hand basin whilst others have used it as an art studio and used the bathroom space just for storage. The “Brunswick” is also great for a teenage retreat as there is enough room for a toilet, corner shower, vanity and a kitchenette. It also comes with a 1.5 metre covered verandah. This cabin comes as a kit only. Kitchen, bathroom, electrical, plumbing and other items are not included in the kit price. There are Variations to the Brunswick Cabin Kit. Choose between our most popular 44mm size cabin for $14,990 or upgrade to our 70mm thick cabin for just $1000 more. This size is common to be used as a home office for 1 or more people. Plenty of room for several desks and a meeting table with a small kitchenette and bathroom. This is a broad catergory. Visiting relatives from out of town, expanding families needing more room, teenage retreat, divorcee accomodation (it happens), even Air BnB rentals or local traveling workers accomodation. Use for your own needs or rent it out as an income source. A great space for a pool table, or a big lounge and TV, so you can kick back and enjoy family and friends in a safe, casual and entertaining environment. Enjoy the ability to potter in your favourite hobbies in your own dedicated space. Art Studio’s, Pottery, Sewing, Beauty Rooms, Massage. It makes a great ‘chill out’ space to read a book, Tutor Music or even Home Schooling. Relax and Recharge with some soft music and a cuppa tea to have a break from the day to day grind. Plenty of clients say their cabin is their favourite “Happy Place” away from the day to day grind. Nothing beats a dedicated space to work on your favourite hobbies. If your current shed is full of family “items” and doesn’t look like changing anytime soon, enjoy the new dedicated workspace and great size for your gardening passion or computer repairs, or whatever you like doing. Its really up to you. Enquire About This Cabin, for More Info to be sent via email. Overall Floor Space 5.4m x 4.2m = 22m² in total. 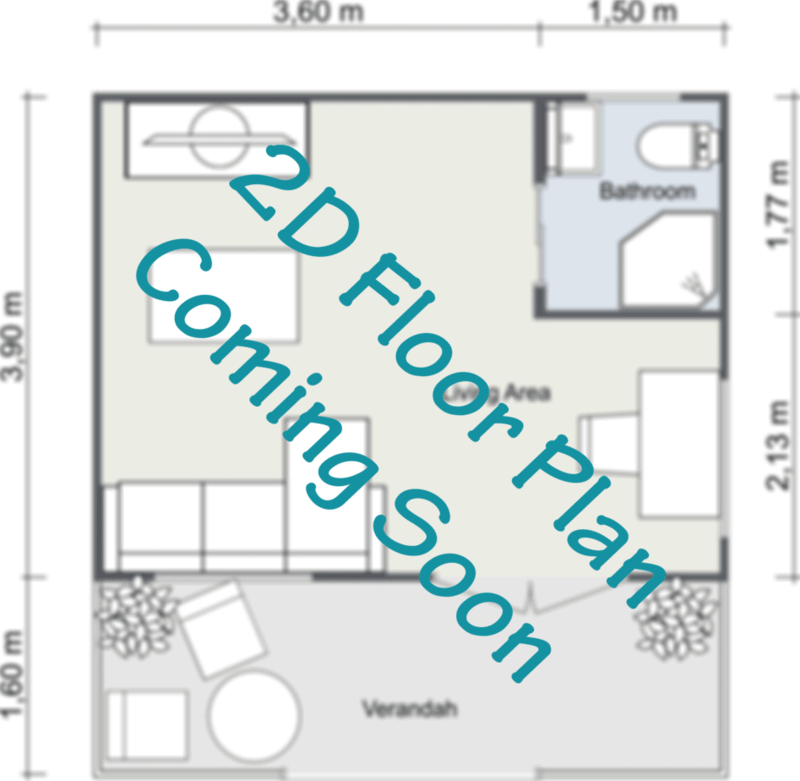 Also included is a 4.2m x 1.5m wide Verandah. With a timber door. Enough space for a corner shower, toilet and small vanity if they are required. 140mm x 45mm H3 treated, resistant to moisture and termites. Cut to size, 44mm or 70mm T&G (Tongue & Groove) Timber. Ready to Assemble, then Seal and Paint. 21mm Tongue & Groove (T&G) Solid Timber Flooring. 140mm x 48mm, Full Span for N3 wind rating. 21mm Tongue & Groove (T&G) timber. Colourbond is an optional extra that we recommend for all cabins. Used in the sub-floor construction. 125mm round treated pine H4 posts at 800mm in length per post. The standard Brunswick Kit comes with 3 Double Glazed Timber Windows. “Double Glazed” Half Glass French Door with handles and locks is included in the standard Brunswick package. Easy to Follow Building Plans are included with the cabin kit. We also have a range of instructional videos to help DIY’ers build the cabin step by step. Our standard base kit is included in the price, But Note: Base kits can vary in price due to site specifications. Cabin heights off the ground can add additional post length. If soil tests are required, some hole diameters and depths may vary and some site specific engineering may be required depending on your cabin usage. We will advise if any variation in price is required, but it is not common that we need to add some to the cabin kit price. Additional Windows and Doors can be added into one of our standard designs. We would advise the price once we have discussed the options available. Adding or removing items from a standard kit may result in a significantly longer delivery time, as the additions or deletions need to be catered for at the factory as a one off build. If you have had reasonable experience in DIY projects, then our cabin kits are very straight forward and easy to assemble. If your kit does require council approval then you can DIY as a licensed ‘Owner Builder’ or enlist the help of a licenced, local Carpenter or Builder. Sometimes it is a better use of your valuable time and more cost effective to have our installation team come and install it for you. Prices for installation are located on this page. This cabin takes about 1 week onsite for our installers to complete the cabin build to lock-up stage. Delivery price depends on a few factors. Your Geographical Location, Crane truck access on your site and the exaqct content of your cabin kit. Colour Bond Roof Sheeting with Matching Facia and Ridge Capping. 55mm sisolation R2 Roof Blanket between roof and ceiling for thermal layering. price does not include electrical, plumbing, painting, or any kitchen or bathroom fixtures or fittings. Dave and Keith were brilliant and very professional. The Cabin is superb. Thanks to all your team for a great job! Done! The guys did a wonderful job and I'm really happy how everything has turned out. Daz and Dave are top blokes and I had a blast helping them build the cabin. I managed to get a coat of paint on it yesterday in case we get rain next week. It looks great!! Our Deluxe cabin has survived the cyclone we had here a few weeks back, with no damage at all to the cabin (quite a few houses lost parts of their roof) Thanks again. Finally finished the garden. I thought you might like to see some shots of the cabin in location. I love it. I’m starting to live in it more and more. Thanks again Keith for an excellent product and service. Thank you guys for the lovely Cabin. Would love to get another one in the future.